Traditionally known as the stomach of the cell, lysosomes contain enzymes to break down and recycle internal and external macromolecules, like waste materials and cellular debris. The roles of lysosomes have been expanded to include much broader functions such as membrane repair and amino acid sensing. The organelles also emerge as a signalling hub for mTOR to maintain energy homeostasis. With significant implication in various pathological conditions, lysosomal pathways are evaluated as a pharmacological target for lysosomal storage diseases, cancer, and neurodegeneration. Lysosomes also involve the delivery of other biologicals and antibody drug conjugates. In addition, many drugs are found to accumulate inside lysosomes, thus allowing them to contribute to our understanding of pharmacokinetics, drug–drug interactions, and toxicity profiling. Discussing recent findings, up–to–date research, and novel strategies, Lysosomes integrates perspectives from cell biology, pharmacology, toxicology, and biochemistry to illustrate both the basic properties of lysosomes and their potential roles in drug discovery and development. 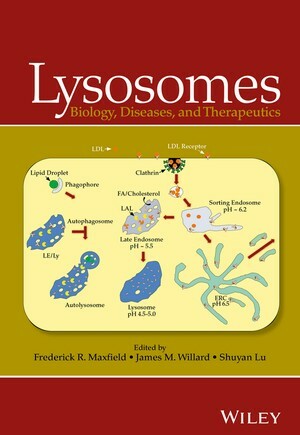 With perspectives from various fields, this book illustrates the potential of lysosomes beyond their cellular function, focusing on disease and drug targeting. An opening section covers basic cell biology and functions of lysosomes including chapters on the lysosome s role in therapeutic pathways, cancer, cell death, and metabolism. The second section explores lysosomes in various aspects of drug development and toxicity and features discussion of autophagy intervention for cancer and neurodegeneration, ADC delivery and efficacy, and drug sequestration in lysosomes and its therapeutic and toxicological consequences. Frederick R. Maxfield, PhD, is Professor and Chair of the Department of Biochemistry at Weill Cornell Medical College. He has used digital imaging microscopy to characterize pH changes in endocytic organelles, to measure the kinetics of transport of molecules among organelles, and to identify new endocytic organelles such as the endocytic recycling compartment. Dr. Maxfield has published extensively on trafficking of lipids and cholesterol. James M. Willard, PhD, has been a member of the Phospholipidosis Working Group at the Center for Drug Evaluation and Research (CDER) of the Food and Drug Administration since 2005 and Co–Chair of the group since 2011. Shuyan Lu, MSc, has been an Investigative Toxicologist of Drug Research and Development at Pfizer for over 10 years. She studies the role of lysosomal pathways and physical chemical properties of compounds in drug–induced toxicity.